One of the things I love about Apple is the way they enhance Mac OS X with great features for other developers to leverage. Built-in spell-checking, incredibly rich edit controls, development environment and the recent Core frameworks are such additions. Core Image allows applications access to real-time hardware-accelerated graphic effects and is used within some of Apple’s own apps for various effects. Pixelmator is the product of a two-man team that provides Photoshop like abilities for $59. Apple would not ship such a product for fear of further upsetting Adobe. Whilst Pixelmator bears a resemblance to Photoshop and will happily open PSD files the user interface is very clean and easy to use and the Core Image filters and correction tools deliver their results in real-time. No more of the tweak-wait-look cycle Photoshop forced us into and gazing at CPU benchmarks working out which combination of processor and OS would be better. Pixelmator also delivers the usual array of painting, manipulation and selection tools, a variety of brushes, layers, gradients, support for 100 file formats, metadata access etc. It integrates with other Mac technologies including the iSight (new layer), Spotlight (search meta), iPhoto, ColorSync, Dashboard (file conversion), Automator and leverages various open-source technologies including ImageMagick, Gradient Panel, Cairo, Sparkle (software update). If you need convincing download the demo and/or watch the introductory screen cast. Future versions will include integration with Aperture (yes! ), RAW file support, .Mac syncing (brushes, swatches etc.) and perhaps even vector support (probably utilizing Cairo). I started programming at 12 and have been fortunate to carve out a successful career in something I love to do. People find it strange when I talk with passion about IDEs, fonts, color schemes, mice and keyboards. To me it seems perfectly natural when you consider a writer has strong preference and passion for pens and notebooks and photographers spend a small fortune on specific lenses and cameras to get the shot they want. For years I was happy with my Apple Pro keyboard and then one day found myself messing around with my Amiga A600 and realized my typing was faster and more accurate on the Amiga than on the PC. Some prefer “ergonomic” split-keyboards, others are impressed by back lighting, LCD screens or even an OLED display in every key. Most reviews skip over the most important aspect – what it is like to type on. I have fond memories of typing away on the IBM XT, AT and 5150 terminals and I found myself at eBay eyeing up an original unused IBM Model M keyboard similar to the ones those machines used. Whilst the keyboard uses a membrane each key has its own spring that buckles as the key is pressed. This gives a satisfying tactile click that saw typing speed further accelerate than on the Amiga. 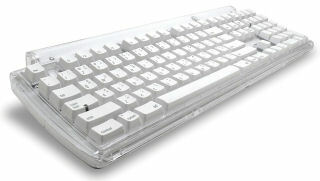 Each key comprises of two plastic parts, the main body and the outer shell or key-cap. This means you can easily re-arrange the keys or put on specialist caps. The Model M is a joy to type on but isn’t without fault. I can live without the Windows keys but the keyboard sports a huge surround taking up masses of desk space, is incredibly heavy and sounds like a machine gun when you get going with it. Apple produced a legendary keyboard too, the Apple Extended Keyboard but this has some immediate drawbacks in that it uses the Apple Desktop Bus, so would need an adapter, and is also tricky to get hold of. I settled on the Matias Tactile Pro which uses the same Alps switches for each key but comes in a more friendly USB version. Designed for the Mac it has some extra keys and helpfully each key shows the various extra symbols available with the Alt key. The Tactile Pro is great to type on however it is even louder than the IBM Model M and only available in the US key-map which means it is a couple of keys short. The enclosure mimics that of the Apple Pro keyboard but uses an inferior plastic that feels cheap and does nothing to dampen the volume but does helpfully feature a two port passive USB hub. Note: The Matias Tactile Pro is an OEM version of the Strong Man SMK-Power989X. Matias now have the Tactile Pro 2. I’d heard some good things about the DAS Keyboard II which unlike it’s predecessor is also mechanical but uses individual switches from one of the original keyboard manufacturers, Cherry. The DAS II is USB and is a little quieter than the other two keyboards but is still loud enough to annoy nearby co-workers and yet nicer to type on than the other two. One of the selling points of the DAS II is that each key is totally blank resulting in one black keyboard but I could take or leave it. Where the DAS does fall down is the large echo-inducing enclosure and the cheap-feeling plastic used for both the keys and the surround. Note: The DAS Keyboard is effectively a custom OEM version of the Cherry G80 series. I only picked up this keyboard a few days ago so my experience with it is not as extensive as the others which all got a fair work-in. Impressions so far are very good despite it being a scissor-switch like most laptops and not mechanical like the others. The surround is an absolute minimum which is fantastic and it looks great. Noise levels are sufficiently quiet and the feeling very enjoyable despite the low-profile and gaps between the keys. The addition of a built-in USB hub is useful but MacBook Pro style light-sensitive back lighting would have been great. I’m sticking with the Apple at home for at least a couple of weeks and will continue to use the DAS at work for now. The Model M and the Matias are currently gathering dust in the cupboard. I have already modified my DAS II by removing it from the enclosure and placing it on a soft sponge material. It is immediately much quieter with less echo and a soft wrist rest which solves some of the issues. Replacing the keys with a softer rubberized plastic would be great but injection molding is rather expensive. Check out the GeekHack keyboard forum for like minded chat.